Let me just take a moment to say.. WOW. Just WOW. I haven't written here in almost a month now! But not because I didn't want to! Lemme explain! I had some very important events for the month of august. One of my very close friends got married and then I had this huge vacation to get ready for. I don't even know how but while I was so busy packing and shopping the entire month slipped away! I am currently on vacation and have some free time. Time enough to make a blog post so here I aaam! I've missed this beyond words can describe! 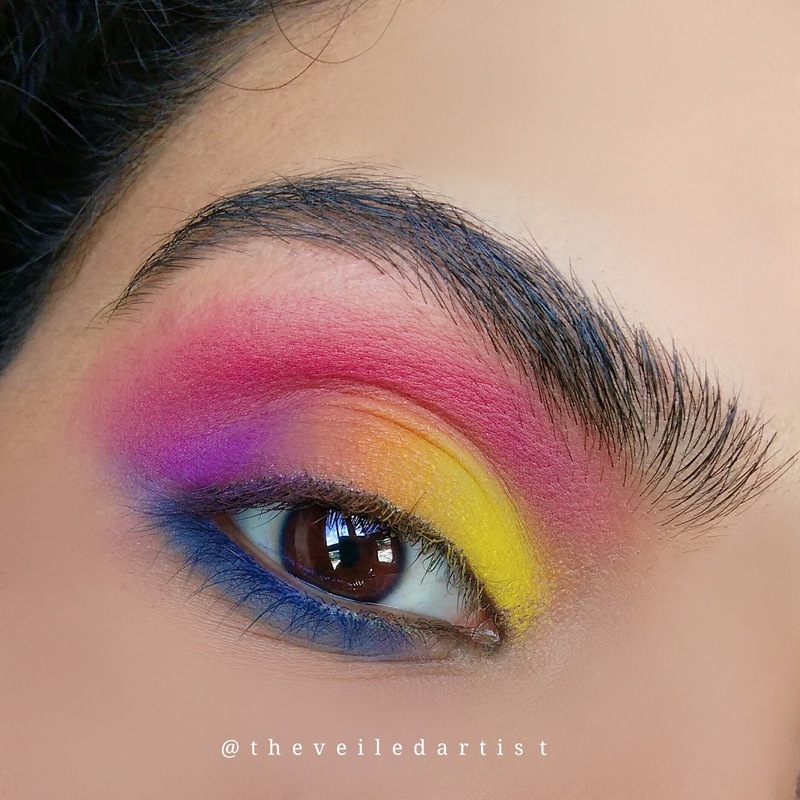 So anyways with no further delay, let's get started with today's bright colourful rainbow inspired tutorial! 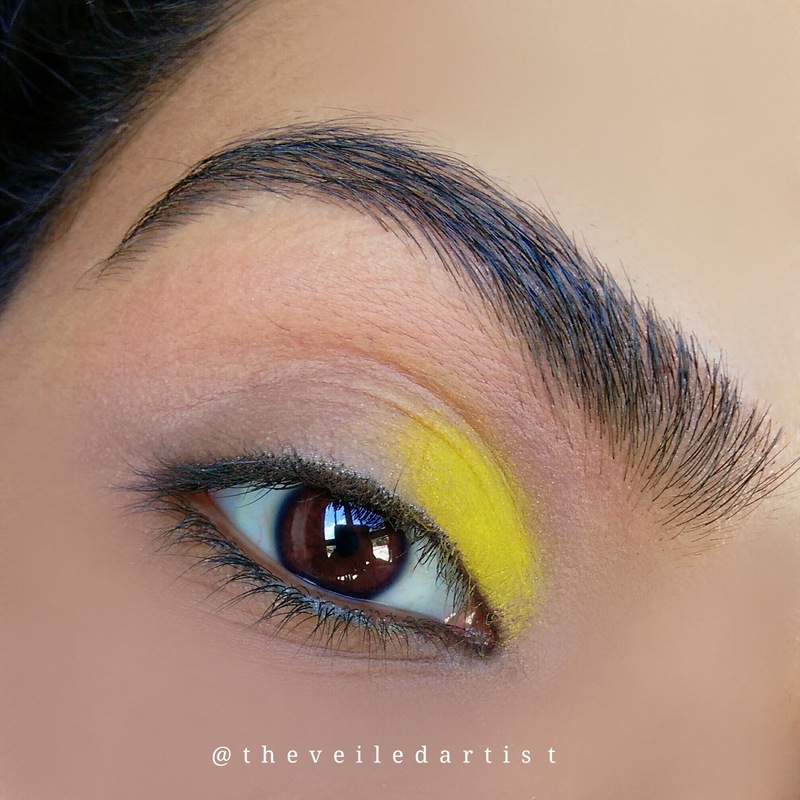 After priming your eyelids with eyeshadow primer or foundation, apply the bright matte yellow shade into the inner one third of your eyelids. 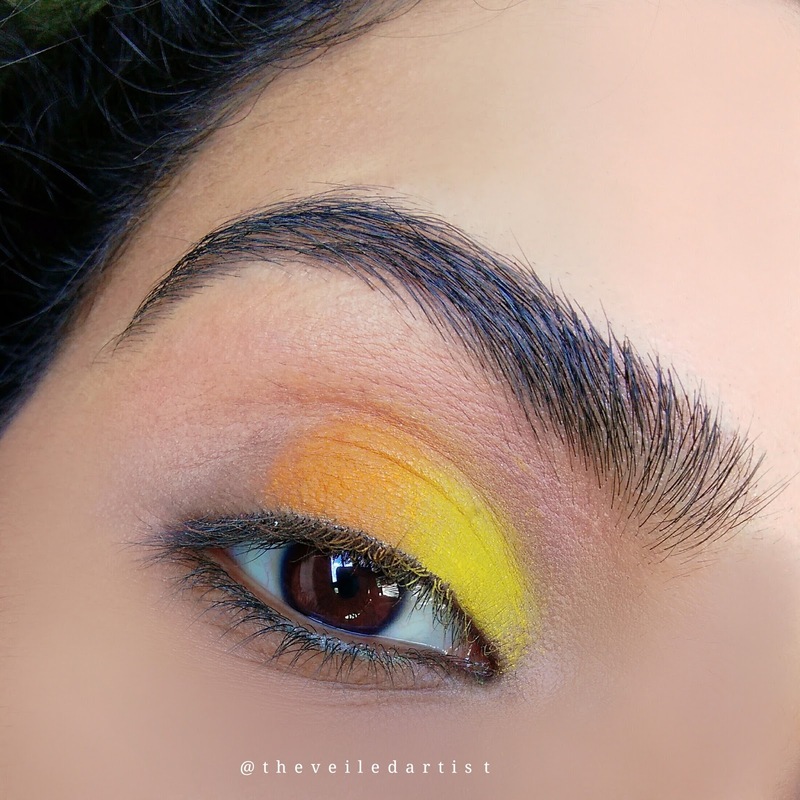 Next, pat the orange eyeshadow into the center of your eyelids and blend it slightly into the yellow we previously applied. 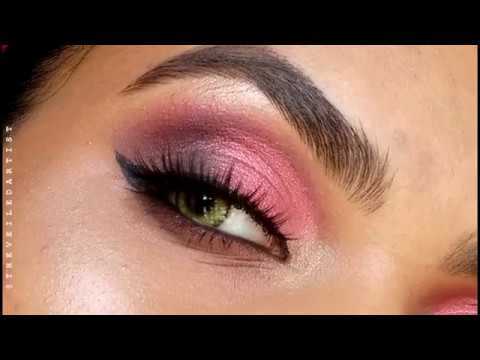 Blend the pink/red eyeshadow into your crease and a little above it. 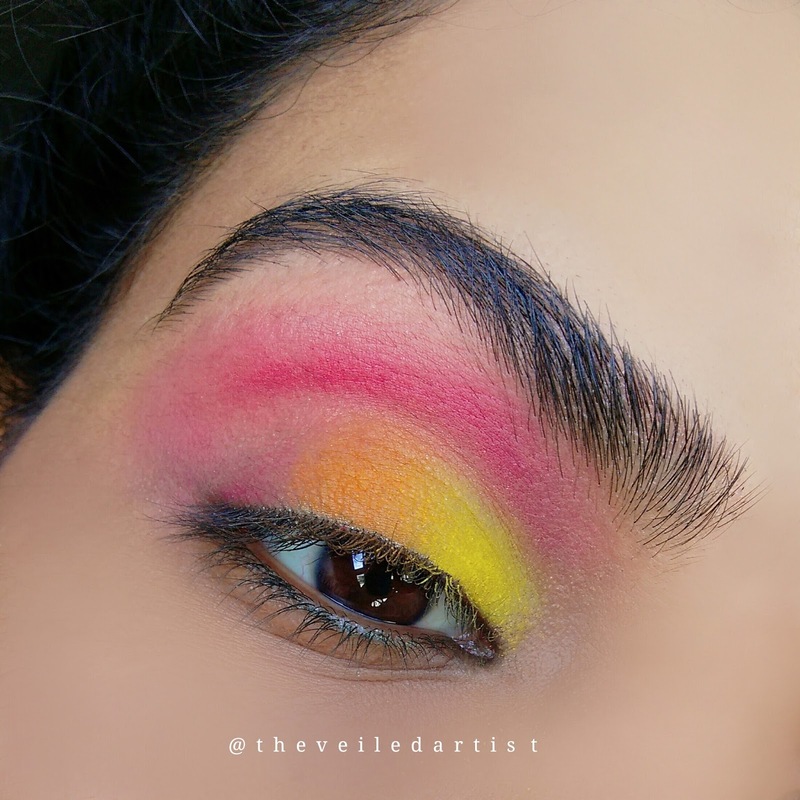 I personally used pink instead of red because I felt like the red would collide with the already warm orange and yellow. But you can use either red or pink. 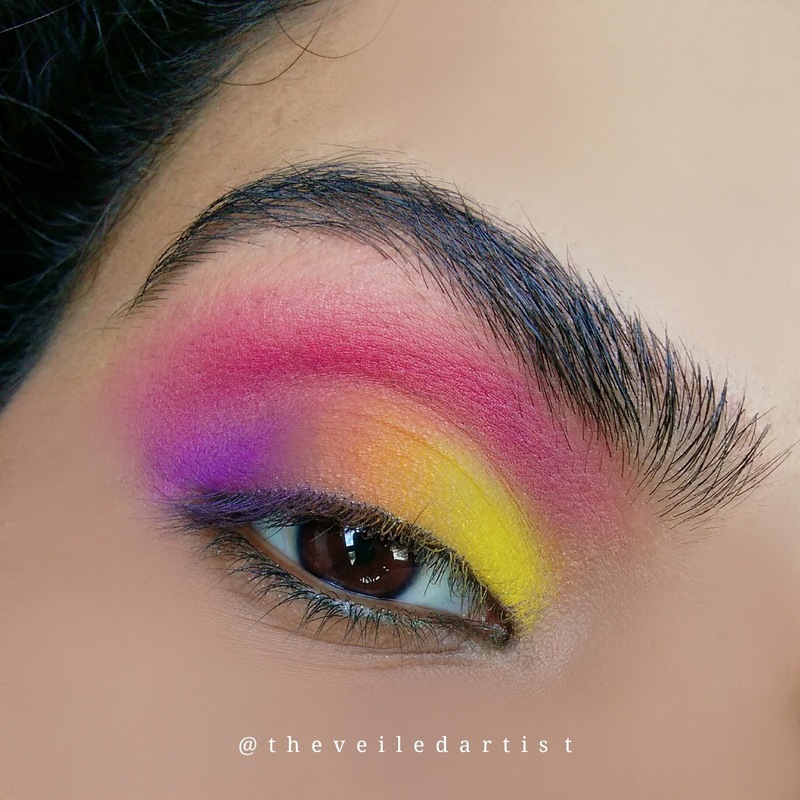 Blend the purple/violet eyeshadow into the outer third of your eyes and into the pink and orange we previously applied. 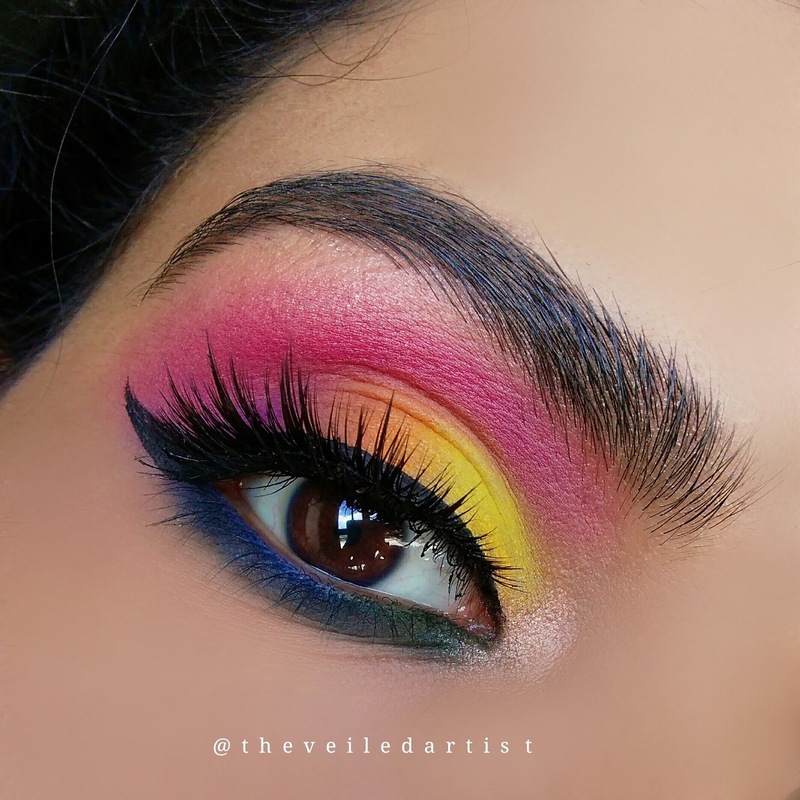 Blend the matte blue eyeshadow into the outer half of your lower lashline. Next blend the medium green eyeshadow into the inner half of your lower lashline. I chose medium green instead of light green because light would look too bright and take attention away from all our eyeshadow work on the eyelids. Pop in a champagne-y highlight shade into the inner corners of your eyes and just under the brow bone. Do your winged liner! I just love what some bold winged eyeliner adds to looks like these! Next curl your lashes and apply mascara. 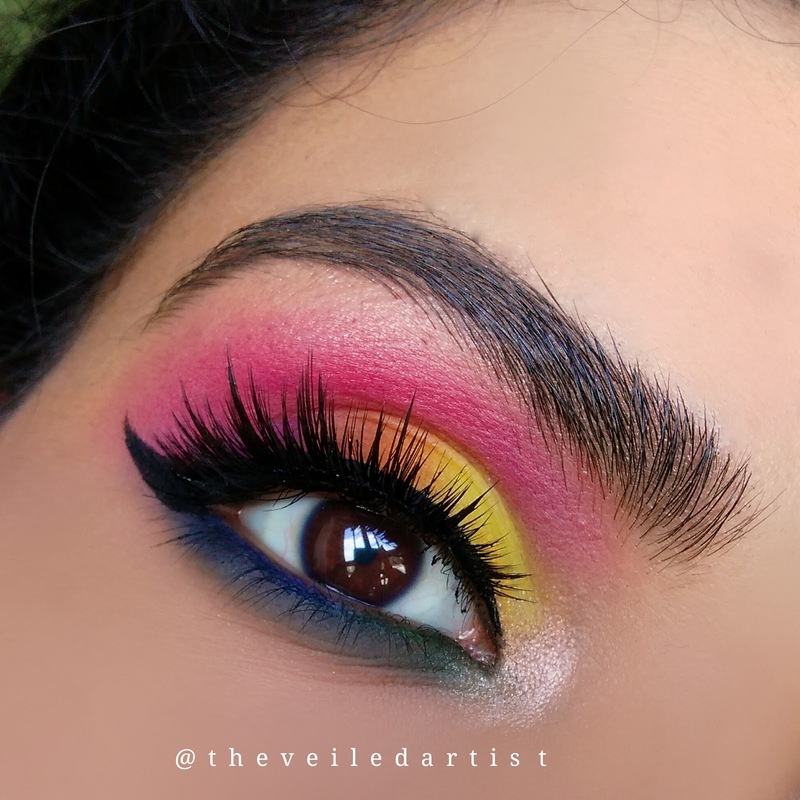 You can finish the look here but I added some falsies for extra drama! I'm wearing the house of lashes lash in style knockout. 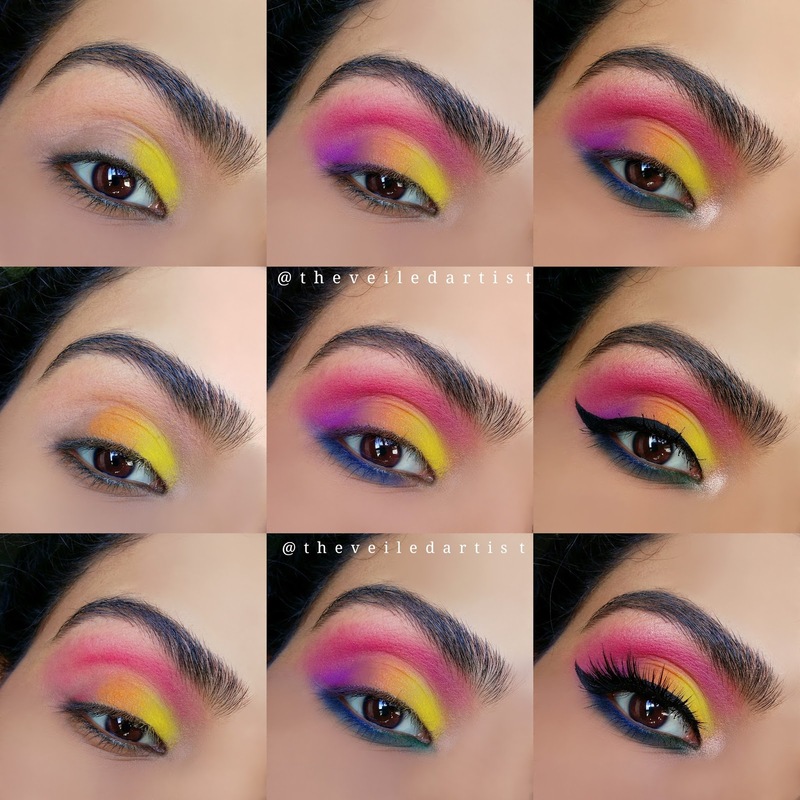 Scroll down for the pictorial and products used list! And that's it for the look my loves! I really hope you enjoyed it and try to recreate it! 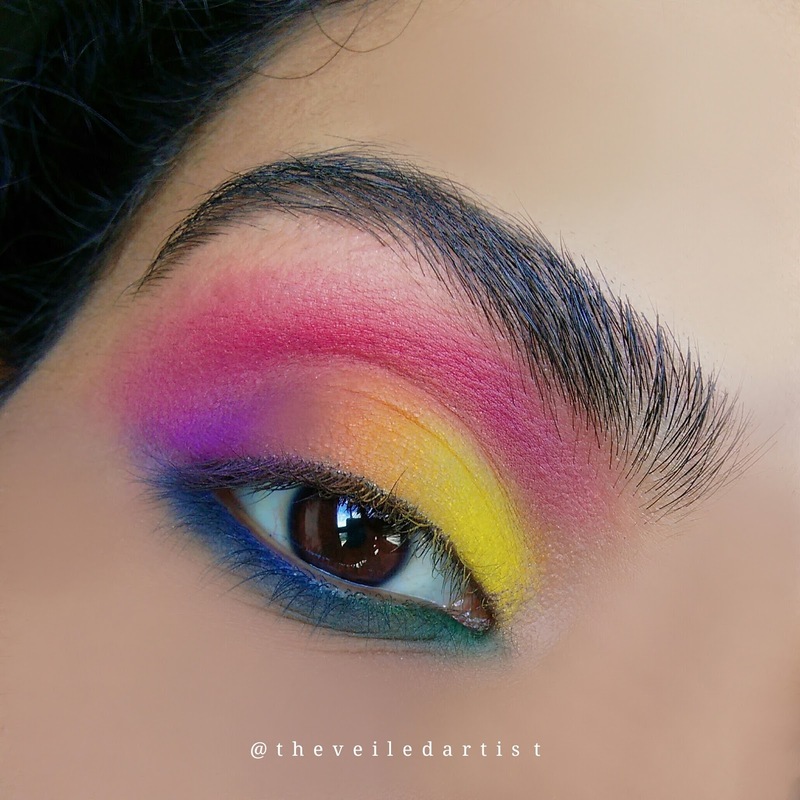 You can tag me @theveiledartist on any social media platform to show me your work if you want to! I would love to see them! You can check my last post here. It was a tutorial on some gorgeous sultry bronze-mauve smokey eyes!